Two beautifully painted baby dinosaurs, the Rebor Scout series baby Stegosaurus (Melon) and the Rebor Scout series baby Triceratops (Hazelnut). A pair of Rebor dinosaur models. 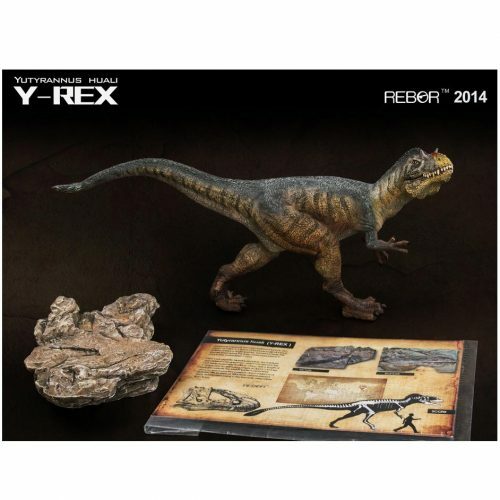 Two fantastic Rebor baby dinosaur models (Scout series). A fantastic model of a baby Stegosaurus (Melon) and a super replica of a baby Triceratops (Hazelnut) available as a pair of Rebor baby dinosaurs. Length 10 cm to 11 cm approx. Yes, they’re as anthropomorphic as any of Rebor’s works, but they’re equally as beautifully realised and produced, too! “Melon” is as nicely sculpted and painted as can be expected from Rebor, and comes with a slightly swampy looking base rather like the one that accompanies Savage, and this hints at what the company has in store for their adult Stegosaurus. In the meantime, this little model looks lovely with the Stegosaurus by Bullyland, as she is a rather good colour/pattern match! Hazelnut” is adorable, and although the sculpt is not as detail intensive as the baby trike by Papo, the overall proportions are a bit more in keeping with the reality for baby ceratopsians. Hazelnut is equally as adorable as her Papo counterpart, and comes on a rather basic base that matches that of “The Fallen Queen”. She’s an excellent addition to a ceratopsian herd. It’ll be interesting to see whether Rebor apply the recent research on Triceratops skin to their “King Trident” sculpt!